Introducing what I hope will be the first of many installments of "Lost & Found, Bought & Sold" where I will highlight newly lost or discovered manuscripts, works of art, artifacts, etc. as well as notable sales of the same. Today's column includes a literary treasure hunt and the sale of a macabre manuscript from Salem. 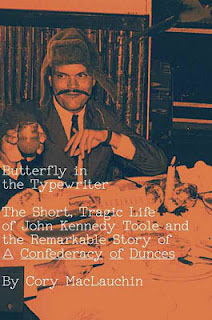 The biographer of enigmatic author John Kennedy Toole discusses tracking a lost manuscript of the Pulitzer Prize-winning novel, A Confederacy of Dunces, and finding a valuable source of oral history instead. The biography, entitled Butterfly in the Typewriter by Cory MacLauchlin is being released today and looks to be the book for which fans of A Confederacy of Dunces have long been waiting. Earlier this month, a Salem witch trial manuscript was sold at Swann Auction Galleries in New York City for $26,000. The 1682 indictment is rare and puts on paper the many crimes with which Margaret Scott, a septuagenarian widow, was charged and for which she was later hanged. Original indictment of Margaret Scott for "certaine detestable arts called Witchcraft and Sorceries." The manuscript was only one item from the fascinating Eric Caren collection being sold by Swann over the course of several sales (the final sale is scheduled for fall 2012). The collection is the result of Caren's obsession to "document every important event in modern history through books, manuscripts, autographs, photographs, posters and ephemera that span the 16th century through the 1970s," according to the auction catalogue. What an ambitious undertaking!